If you are in search of a unique gambling website, your search should end at Skin Joker. With a simple design that works properly with no hitches, fast loading pages and no risk of getting lost while navigating, Skin Joker offers you a lot of fun and of course, the joy of winning big! Skin Joker is basically a third-party website on which you can bet on in-game skins which have real-world value within the Steam Community Market. Skin gambling is a very popular form of betting on in-game items and there are various ways such as mystery boxes, public pots, Esports betting, gambling games and so on, with which you can do that. Of these, Skin Joker uses public pots which is perhaps the most direct as it’s gambling with other players purely based on odds. In order to multiply your skins, you have to deposit skins in a shared pot within the stipulated time. Once the time is over, no bet will be accepted. Then a winner is chosen by the system on everybody’s entries. The higher the value of the skins you deposit, the higher are your chances of winning the pot. 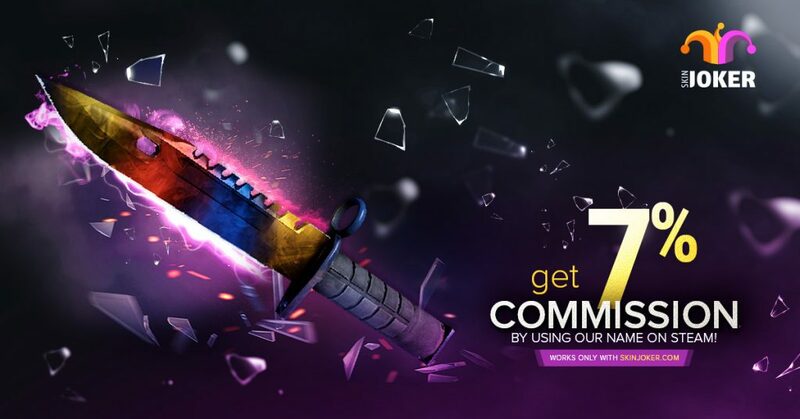 The design of Skin Joker is what you might be looking for on any gambling site. It looks as if it is a stripped down variation of other services, but there is a difference – it works extremely smoothly and you will face no hang-ups. Right when you access the platform, you can see all the links at once. They are written in big legible fonts. So, there is no risk of getting lost while navigating. What’s more, there are no high resolution graphics. Instead there are small PNG files because of which there is no delay in loading of the pages. One thing to keep in mind while taking a username is that, if you have SkinJoker in your name, you’ll get a lower commission. Also if you keep it for very long, you will get a random prize. This is the basic fun on most of the multi-gambling CS:GO sites. There is only one difference and it’s that you use items, stickers or cases to gamble in place of coins. They take commission anywhere around 5% to 10% depending on how valuable the skins are or how big the pot is. This too is common in most CS:GO gambling services. However, their Coin Flip is a sort of unique because you get two options to bet. You can either use skins or coins that you get from a promo code. The odds here are 50-50, but infrequently you can find someone creating a game of coin flip where odds are set by a user. It depends on you if you wish to flip the person with those odds. Binary is a sort of uncommon feature. It acts like a stock exchange graph. You place a wager and have to guess if the graph will go up or down after a round. Each round is of 30 seconds and hence, if you want to make big wins, you should know how to predict graphs. Just like Coin Flip, you can either use items or coins to play this game. Binary game is hurtful! They take an enormous 35% commission at every round when you bet. You should play this game only if your pockets are full and you very well know how to predict the movement of the graph. 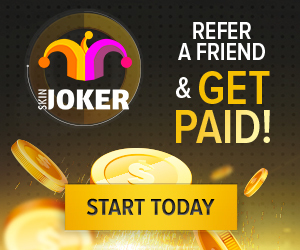 Skin Joker has a great referral program too. They have five levels in the referral program and you can start with a 0.1% commission on all stakes from the people you have referred. Plus, there is a weekly Skins Giveaway, another great chance to multiply your skins, which they often offer through Twitter or Gleam. All in all, Skin Joker is a game you should play if you want to have true fun of playing as well as winning!